In this interview, Michael Tisdale talks about collecting vintage Bolex-Paillard home movie cameras and related ephemera. Based in Atlanta, Georgia, Michael can be reached via his website, Bolex Collector, which is a member of our Hall of Fame. Collecting Paillard-Bolex cameras was something I started doing by accident. It was a combination of several interests I had, including, photography, broadcasting and even collecting vintage records and magazines. I became really passionate about the Swiss craftsmanship and the high quality of the cameras. And I started trying to trace the history of the Paillard Company and the fascinating range of items they produced. I didn’t really set out to start a collection of cameras, it was really something that happened gradually. I didn’t even see the cameras at first as being collectible, and to some extent, I still don’t. But they’re really very usable cameras. You can still buy 16mm and 8mm film, and there are still technicians who will repair or modify the cameras. They’re still used in film schools by students, and many people still use them to shoot independent films and documentaries. It’s an odd thing to collect because their value is really determined by the usability and features and not so much age or rarity. Even though most of them are 40 or 50 years old or more, they’re excellent cameras and just too nice to sit on the shelf and not run film through. At the same time, I’ve become passionate about appearance of the cameras and even the history of the company itself. I’ve found myself adding more and more of these cameras to my collection over the years, whether they’re working or not. They’re wonderful to display and look at. And best of all, most of the models are fairly inexpensive these days compared to the small fortune they cost during the 1940s and 1960s. When I bought my first Bolex camera around 1991, I was looking for a cheap motion picture camera that offered the ability to shoot single frames and timed exposures. I was majoring in broadcast journalism and photography, and wanted to experiment with some simple animation and time-lapse photography. I found a Bolex H16 for $90 in the classifieds section of a camera magazine, and thought it was a good deal. It included a set of lenses, the original case and some accessories. But when it arrived in the mail, it ran really poorly and looked even worse. It was rusty and the leather was peeling, and there were insect carcasses and what appeared to be vegetation in the viewfinder. I didn’t know where to get it fixed at the time. But even if I had, it wouldn’t have been worth it. It still sits on my shelf now. At least I’ve been able to salvage the accessories and stuff. Around the same time, I was an avid vinyl record and vintage magazine collector, and I’d travel a few hundred miles every month to go to memorabilia shows. To make the most of my trip, I’d sometimes visit local thrift stores and antique stores. And as a kid, my parents would take us to flea markets and antique stores, and while they went through antique furniture, I’d look through old ephemera and vintage toys and coins and soda bottles and stuff like that. I had a love of collecting things as far back as I can remember. Back around ’91, the antique stores were still filled with old 8mm home movie cameras and projectors. Most people considered them junk at the time. I’d pick up an occasional Bell & Howell or Kodak camera for about $5, and that’s when my collection of old movie cameras started. Some people, by the way, refer to it as cinematographica. And actually it’s a variation of the word cinematograph, which is an early word for the film camera or projector. Back then I never came across any Bolex cameras, but occasionally I’d find a Paillard-Bolex brochure or Bolex Reporter magazine. That’s when my interest grew as I started to learn more about the history of Bolex cameras and the different models. A few years later, I met a film professor with a similar interest in collecting old movie projectors. He had lots of old cameras and projectors, a nice collection, and he told me about an antique store on the coast of Mississippi that specialized in photographic equipment and was filled with Bolex cameras. So I went down there, and I still remember my first visit. It was a corner antique shop with glass windows, filled with different Bolex models on display and projectors and vintage advertising signs. It was like stepping back in time to an old 1950s camera store. I can’t remember how much I bought that first day, but over the next few months I made multiple visits until I found myself with a substantial amount of cameras and a projector and lots of advertising and ephemera, all Bolex stuff. Best of all, I finally found a fully working H16 that I could shoot with. Then in 1998 I discovered eBay. I sold off my non-Bolex cameras and movie equipment because the quality just didn’t compare to Bolex and I was running out of room. eBay had a huge amount of Bolex cameras and projectors and ephemera for sale, but it took a lot of the joy out of finding things and building a collection. These days most Bolex cameras end up on eBay, and it’s almost impossible to find them in estate sales or antique stores anymore. Collectors Weekly: How come you don’t see Bolex movie cameras in antique shops anymore? Tisdale: They don’t have much value as a collectible. People find them and put them on eBay expecting to make a fortune like it’s a Leica or something, but they don’t. People who collect movie cameras are a minority compared to people who collect vintage still photo cameras. Most people who buy them are looking to actually run film through them. But they look interesting, like they might have some value, so people buy them up and they’re not in antique stores or even estate sales anymore. Once you buy a Bolex, you fall in love with the quality and you need to buy more. They have different features and offer different functions so they appeal to most photographers’ love of gadgetry. And then there are collectors like me who are really interested in Bolex in particular, the history of the company. I collect everything from Bolex advertising to brochures to catalogs, printed material, just oddities, strange things that came out with the promotional items. The original boxes, original cases, advertising ephemera. There were even a few promotional records they put out. Also Bolex dealer stands and advertising signs are a particular interest of mine. 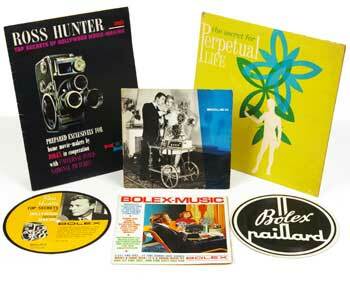 Bolex was a Swiss-based company, and they had worldwide distributors. The United States was actually their largest market outside of Europe. In the 1940s a distributor opened up that sold Paillard products. They put out a good deal of some unique advertising signs and camera displays that they sent to authorized Bolex dealers throughout Europe and the rest of the world. These included lit glass dealer signs that were hung in windows, hanging metal door signs, and dealer stands and displays the cameras were mounted on. They usually had the Paillard-Bolex emblem, the gold, red and black emblem circular logo. And I have a few of these in my collection as well. It’s a really nice way to display the cameras. Later, in the 1960s and 1970s, Bolex produced a few promotional display stands that aren’t really as interesting to me because some are made of plastic, others of cardboard with maybe a name of the camera model. But the earlier ones from the ‘40s and ‘50s and early ‘60s are usually brass painted with the logo, and they’re really nice items. They’re hard to find though, I’ve only come across maybe a handful in 15 or so years, and I look on eBay every day. Estate sales are the second best way to come across Bolex cameras. Its interesting when you do come across one that’s being sold by the original owner because they’ll usually have a story with it. What the camera was bought for and how it was used. Sometimes I’ll come across one that was used by somebody who worked in television in the ‘60s or ‘70s as a television news photographer. That was their personal camera. With the smaller 8 cameras, I’ve had people tell me that was their family camera. I always follow up by asking if they still have the home movies that go with it and if I can buy those. I collect all films as well, just of anything really to go on my Bolex projectors. I don’t collect Bolex projectors as much as I collect the cameras and accessories and ephemera. The cameras are usually bulky. And once I have a good projector in each format, for 8mm film, Super8mm film and 16mm film, I don’t feel the need to have any more. Collectors Weekly: Earlier you mentioned the Swiss craftsmanship on the Bolex… why was it so good? Tisdale: The Bolex was a really unique camera. A spring-wound clockwork motor camera built in Switzerland. The spring-powered motor wasn’t unique to Bolex cameras. In fact most home movie cameras, before Bolex cameras were produced, were spring-powered, especially in the United States. In the United States, home movie cameras became really popular in the late ‘30s, part of the ‘40s, even during wartime and in the ‘50s, partly because the postwar economy was different than in Europe. After the war in the United States, home movie-making really saw a surge whereas it didn’t catch on in the same way as Europe. So the pre-Bolex home movie cameras that were spring-wound, had what was called a wild spring motor. You wind up the spring with a key or a handle, like winding up a watch. Basically a tension-powered motor, which when you released the exposure button, would wind down. And as it got to the end of its wind, it would start to slow down. Bolex cameras were different in that they were governor-controlled. Basically Bolex cameras are built like a Swiss watch. In fact during the ‘50s, they actually used that slogan for advertising in the U.K. They are really precise cameras. When you wind it up and press the exposure release, it stays at a constant speed. It’s really just the Swiss craftsmanship. They still run just as well today as they did then if they’re still properly oiled, unlike some of the older Kodak and Bell & Howell cameras with the wild spring motors. The Bolex cameras run at a constant speed from start to finish. In the U.S., Bolex cameras were considered high-end. They were expensive, an import camera. There were a lot of makers of home movie cameras in the United States at the time. Kodak and Bell and Howell were huge companies, they dominated the home movie market throughout the 1940s to the 1960s, even up until Super8 film cameras were introduced. They were really affordable. Bolex cameras were what people aspired to have. They were only available in select shops. At the time, there were a lot of amateur camera clubs for people who were serious or interested in learning more about shooting home movies or movies in general. The quality of the Bolex caught on with the camera club folks, and by the mid ‘50s the popularity really increased among both amateur and professionals. 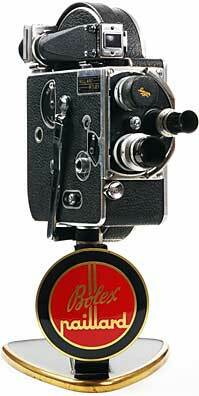 Bolex was made for the home moviemaker, but the quality was high enough to be used professionally. At the time it was even used in television production, commercial production and documentaries, but it was also simple enough to be used by any amateur moviemaker. Collectors Weekly: When did people start making home movies? Tisdale: Home movie-making existed even in the 1920s, and Bolex didn’t actually introduce their first camera until about 1935. Home movies really caught on with the introduction of 8mm film in the U.S. in 1932, which was a less expensive alternative to 16mm film. In the ‘30s in the U.S., despite the Great Depression, there were several U.S. manufacturers of 8mm home movie cameras. Companies like Kodak, Bell & Howell, Univex, the Universal Projector Corporation, (a Chicago-based company). There were even home movie magazines. It started to really gain popularity in the 1930s, and there were lots of models of cameras to choose from. During the war, a lot of these camera companies turned their production efforts toward wartime production. They produced lenses, camera bodies and just a wide range of other things for the war effort. So the cameras weren’t available to users. You could buy the used ones or trade. After the war, because of the war, a lot of these companies came up with new innovations. Lenses got faster. The soldiers started coming home and families wanted to take pictures. So home movie-making saw another surge. That first Bolex camera in 1935 wasn’t really widely available in the United States before or during the war, except for a small distributor in New York City, the American Bolex Company. Things really picked up in the late 1940s, and the ‘50s was the peak of popularity in the United States for Bolex cameras. Bolex actually offered credit plans and camera exchange plans to get people to buy their cameras. And that really helped boost their popularity. But they really just took off because of the quality. During the late ‘40s and ‘50s, home movie-making was almost as popular as taking still photos. It became popular to take vacation films, and some people took it a step further and would get into making small films, even kids and teenagers. The camera magazines during that time are full of stories written by readers who came up with a unique way to modify their camera or create their own title and make animations. It continued until the mid ‘60s, and Super8 was introduced in 1965. That became even more popular because it was so easy to use: you just put your cartridge into the camera, everything was automated. So that’s when home movies really surged in the United States, but at the same time the quality went down. People started putting less effort into it. You got the camera panning around the living room, and everybody would wave. And that’s when home movies became synonymous with a miserable time at the uncle’s house, watching this film with the kids waving at the camera. By contrast, the short-wind periods of spring-wound cameras usually lasted only about 30 to 40 seconds. So you had to put more thought and pre-planning into your shooting. People would also splice. They’d buy editing equipment and edit, and put titles at the end and beginning. That’s another reason why I like to collect old movies. Some of this stuff is really well shot. It’s really interesting to see, especially the older color stuff. Color stock always cost a little more, but it was pretty common. In the 1950s and the postwar era, you see a lot of home movies shot in Kodachrome, and of course Super8 was almost always shot in color Kodachrome. But color film was available even in the ‘30s. It’s not uncommon to find colored home movies from the 1940s. Collectors Weekly: Who made the first home movie cameras? Tisdale: If you mean amateur-type cameras as opposed to 35mm, in 1922 there was the Pathe film camera, a 9.5mm film camera. It was a low-cost format for the home distribution of commercial film, sort of an early Blockbuster video store concept. Films could be distributed for public showing or you could buy them for your own home movie projector. In 1923, Eastman Kodak introduced 16mm film and marketed it as an alternative to 35mm motion picture film for amateur use. With 16mm film, an amateur could get into filmmaking. The first Bolex produced in 1935 wasn’t actually their first design. The Paillard Company actually began in 1814 in Sainte-Croix, Switzerland. It was just a small workshop that made clock movements and music box mechanisms. Around 1875 the business expanded into a production factory for cylinder music boxes. And by the early 1900s they began to branch out as a manufacturer of typewriters, gramophones and radios. The first actual Bolex camera, the Auto Cine, was designed in 1928 by a guy named Jacques Bogopolsky, a Ukrainian engineer who lived in Geneva. The company called it Bolec, which they later changed to Bolex. Original Bolec items are almost impossible to find. I’ve seen a few on eBay, and I always get outbid by one guy. Paillard then opened a cine division to produce motion picture projectors because at the time the home movie amateur format was popular. But they were also interested in Bogopolsky’s camera design, and they bought the rights to it. 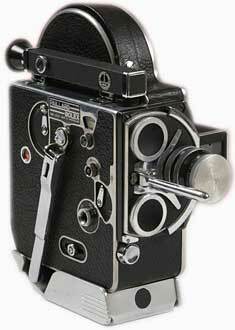 It was modified by Paillard engineers and produced as the Paillard-Bolex H16 in 1935, a 16mm camera. But since 8mm film was a more popular format for home movie-makers in the United States, Bolex came out with an 8mm version three years later called the H8. Over the years, though the H16 and H8 saw improvements, the body of the camera stayed virtually the same, which sometimes makes it difficult for people to tell a later model from an earlier model. The H16 developed into a camera for mostly professional and serious amateurs for use in documentaries and television production. Collectors Weekly: What are some of your favorite Bolex models? Tisdale: I’m only interested in the Paillard-Bolex era. After 1970, the company was sold to Umig, an Austrian manufacturer of home movie equipment. I’m mainly interested in the cameras that were only Swiss-developed and Swiss-built, which includes some of the later Super8 cameras as well. 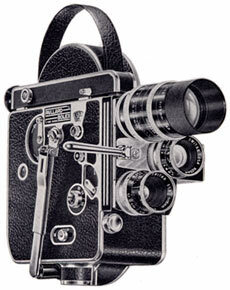 There are over 53 cameras that Paillard-Bolex produced from about 1928 to about 1970. I like the H16 and H8 for their features. I like the H8 reflex for the economy of the film size, which is double 8mm. I also love the smaller models known as the B8, C8 and D8. They were called pocket-sized cameras, they’re handheld, but don’t quite fit in your pocket. They’re easy and fun to shoot with. Basic… all the features are manual. They also have a single-frame capability too. The later 1960s models are interesting, too, because they’re smaller and offer reflex viewing so you can focus and view the frame through the lens that you’re shooting with. They added battery-powered exposure meters in the late 1950s. My favorite is the basic H16.. It offers a bunch of features like different filming speeds and a three-lens turret. And the appearance is great, with the leather-covered body and polished aluminum and chrome highlights. It’s just a wonderful camera to look at, and even better to shoot with. It’s not my favorite thing to collect, however. I like collecting the cameras, because they’re pretty inexpensive to buy. But I also love the accessories that come with them, additional lenses, parallax viewfinders, original boxes, and sometimes even the original owners’ certificates. There’s original camera manuals, brochures and lots of ephemera. I probably have more ephemera than actual cameras. And finally, the Bolex Reporter magazine. One thing I like about collecting them is the progression of the covers. It took me a long time to find the very first Bolex Reporter. I finally found it in two binders full of Bolex Reporters that I found in a bookstore, I was really happy about that. It’s really basic, that first issue. Then later on they had the design with the film stripped down the side. My favorite period from the Bolex Reporter is the color photo covers from the late ‘50s up until the early ‘60s. And then by 1961 they went from being a quarterly magazine to just semi-annual. Collectors Weekly: When collecting Bolex cameras and ephemera, what are some key things to look for? Tisdale: These days I have enough functioning cameras, so I mostly look for unique cameras or something with extras. I like it in the original box, with a set of lenses, any accessories that should have come with it when it was first purchased, and the original receipt and registration card. Close to the original condition, if possible. If it’s a camera that I want to use, I want it to be fully functioning and preferably serviced. Some of the earlier models are hard-to-find, any really early H16 or H8 model from the ‘40s or late ‘30s. It’s nice to see the small evolutions and changes in their development. Like before the frame counter, after the frame counter, changes in the viewfinder, small changes in the speed knob and stuff like that. There’s also some interesting accessories to collect. In the ‘50s Paillard came out with a stereo attachment for the Bolex H16, to allow the filmmaker to create 3-D home movies. It attached to the front of the camera, a two-part lens system. When the film was developed and then ran through a projector and with the attachment put in front of the projector lens, it projected a stereo image, so with special glasses you would see a 3-D image. They are usually pretty sought after, especially a complete Bolex stereo kit, which includes the lens attachment, the brackets and the viewfinders, and then also the projection lens. Then there’s the actual editing equipment, which came out in various types of boxes with different logos on them. And things like underwater attachments so you could shoot underwater, and titlers where you’d attach the camera to a bracket and shoot the camera at a screen where you put up letters so you could add titles to your films. Collectors Weekly: What ultimately happened to Bolex? Tisdale: The popularity of Super8 is what killed them. Bolex was slow in developing a Super8 model camera, and by the time they did, two years after Super8 film was introduced, it never really caught on. It was a unique, odd design, their Bolex 150 Super. And it was high-priced, but at the time there were other manufacturers making even better quality Super8 cameras with more features for a much lower price. Over time another model came out, the 155 Macrozoom with really close focusing ability, and then two other models. The company invested so much money into the production of the Super8 model that they needed to restructure, and they sold part of the company to Umig of Austria. But Umig declared bankruptcy in the late ‘70s, and the Bolex name was bought back by former employees. It actually still exists now in Switzerland, and they manufacture 16mm cameras, basically what they had produced in the ‘70s. It’s a high-quality camera, but expensive. They also have a Super16 version available. Collectors Weekly: Are there any clubs or organizations for Bolex or home movie ephemera collectors? Tisdale: At this point it’s a relatively small community of people who collect Bolex cameras, which is an even smaller niche than people who collect old movie cameras. It seems to be growing, though. Generally we all share the same interests, which is photography or cinematography or movie-making. Over the years I’ve met a bunch of people online through my website from the United States to Switzerland and the U.K. and Germany, Australia and just all across the world. Collectors Weekly: Are there any good books or resources out there for people to learn more about Bolex? Tisdale: A lot of what I’ve learned came from collecting Bolex Reporter magazines and also books that were published in the ‘50s and ‘60s, hobby books about the camera. In the ‘90s, a guy named Andrew Alden wrote several good books on Bolex, including The Bolex Bible and The History of Paillard-Bolex. Also, there are a few real avid collectors around the country, but for whatever reason, they’re really hard to stay in touch with, maybe a bit secretive about their collection. But some of them have some really interesting stuff, some really unique signage and vintage advertising. Even a promotional display camera that Bolex made with Plexiglas sides to display the inside clockwork motor of the camera. It’s a really great piece, with a wooden base and everything, with the logo. Collectors Weekly: Thanks Michael – is there anything else that you’d like to mention? Tisdale: Some people aren’t familiar with the name Bolex or even old 16mm cameras. But they’ve been used for everything from documentaries to motion picture films and television shows and production. In the ‘60s especially, it became a really popular camera among avant garde filmmakers, underground cinema. People like Andy Warhol and Jonas Mekas, Marie Menken and Stan Brakhage, they all shot experimental films on Bolex cameras. Also directors like David Lynch, Terry Gilliam, Steven Spielberg, I think even George Lucas. All of those guys claimed Bolex as their first camera when they began making films. Will Vinton used Bolex cameras in his early animation work with clay figures. He’s the guy that came up with the term claymation. He first started working with Bolex cameras on 16mm film, doing clay animation. Also one of my favorites is Bruce Bickford. He did the animation in Frank Zappa’s film Baby Snakes, also The Amazing Mr. Bickford and Prometheus’ Garden. It’s all really interesting stuff. And he still makes films with his Bolex reflex today. So all sorts of people used these Bolex cameras and still do, and it’s still one of the more common cameras to find at film schools today. I purchased a vintage Bell & Howell Filmo 8 Motion Movie Projector today (3/24/09) with the carry case and booklets. I really do not know much about the projector, only that the company was established in 1907. If by any way can someone tell me more about this item and what is the value? If needed I can email fotos of it to show the condition and the ability to function correctly. Thank you in advance for the time and effort. I rercently bought a B&H Film O Double Run Eight. No film, and the spring does not seem to work. I would like to know the best place in New York to buy a 16mm movie camera Bell & Howell, preferably the 200EE magazin type with two spare magazins. Hi. What is the market value range of a mint condition working Bolex H16 Deluxe with 3 lenses (16 mm, 25 mm, and 75 mm), the original leather carrying/storage case and original documentation? Year of manufacture was 1950. I have a Bolex Stereo taking lens. The glass that is at the lens shade appears to have coating damage. Can this glass be replaced? I would appreciate some comments. I have a BOLEX 8MM projector purchased in 1960. I also bought the 8mm ANAMORPHIC lens with clip attachment for widescreen projection, screws onto a Bolex camera. The projector belts have disintegrated and unit not used for 21 years. I shot everything in widescreen. I have films I’d like transferred to widescreen 16.9 DVDs and want to sell the projector and Anamorphic lens with projector attachment. I recently found a Bolex K2 Super 8 with Zoom Reflex Automatic lens. My aunt used it briefly in the 1960’s. It cleaned up nicely and still has 25 feet of useable film in it. It works perfectly. Can film be found for it? Can it be processed? Is this a camera a collector would like to purchase? I have a 35mm Pathe Freres movie camera, No. 620, with original pigskin covered wood body, brass hand crank, spirit level and crank speed indicator. The lens is labelled “E Krauss, Paris No. 102158 Tessar-Zeiss 1:35 F50 B te.” The body opens to reveal brass sprockets, spring steel drive belt and two round metal spool boxes. The camera appears to be complete and in very good cosmetic condition. Based on review of entries in the 1995 McKeown’s guide, I’m guessing the camera was manufactured around 1910. Do you have any opinion as to current value and/or best outlets for sale of this unique movie camera? Thanks. I have a Bolex Paillard 16 (T) I think. camera with three lens’ A Switar 16mm 1.8, a Bell and Howell 3inch f3.5 (it has a summer winter setting with birght hazy and dull) also a lytar 1inch f1.9 lens. case and a book with some filters and a little box with some sort of prisim in it. I was looking to sell it but I think it is probably worth more than an Ebay sale. Any idea where I can get it appraised or sold? I recently purchased a Bolex H8 listed as working on ebay, but when I received in the mail, I found that the motion slider is stuck in the M position to the left while the motion button is pushed out as though the slider is pushed to the P position. I am unable to release the motion slider from the M position or push the motion button in and the camera is fully wound waiting to run but not running. Any ideas on what the problem may be or how I can make it run. Thank you for replying, Doug. I PURCHAGE A CAMERA AT A FLEEMARKET IN CHICAGO NOT KNOWING WHAT I WAS BUYING.ALL I KNEW IT LOOK LIKE SOMETHING OUT OF THE 1950.IT,S A PAILLAR BOLEX H16-F25 WITH A 75MM BAUSCH&LOMB LENS AND A 25MM #66905 LENS.AFTHER READING THE HISTORY OF THIS CAMERA IT SHOULD BE WITH A TRUE COLLECTOR AND NOT SITTING ON A SHELF IN MY LIVINGROOM. My father was a free lance cameraman for the tv station in London, Ontario.. at a time when we didn’t even own a tv. We had to go to the neighbours’ to watch his stories on air. I can remember when the first bolex came into the house. It was like a duckling being imprinted; I knew I wanted to be a professional news cameraman then and there. My first stories, filmed when I was 12, sold for $7.50 each to the tv station in Kitchener, Ontario. The Bolex and Bell & Howells and other cameras ended up being put out with the trash. Once video came along there seemed to be absolutely no place for them, except taking up space. I wish I had held onto them. My father kept his Bolex H8 reflex camera he purchased in the 1950s in pristine condition. It’s still in it’s leather case and has a few lenses in the pockets. Does anyone know the current market value for this? Would it be more valuable packaged with an 8mm projector and a splicer/viewer? We even found an old tripod from the same era. Really nice one! I have came across a Bolex i think is an 8mm that was made for the U.S. AIR FORCE. Im not sure but i think it is 1940 to 1950 it is B-5 camera. It also has a mfr serial no. 1 can anyone tell me more about this camera. It’s not correct to point out constant spring tension with Paillard-Bolex alone. Other makes had that, too, and earlier. The H cameras were not made like watches but more accurately like clocks. Paillard & Cie invented much less about their products than is generally assumed. Without evidence but heavily indicated business relations existed between Paillard and the Bell & Howell Co. That was quite normal as most ciné equipment manufacturers bought licences from America. Some advancements were made with Eastman-Kodak, some with Alexander Victor. It’s still the same today when very few enterprises make CPU chips for most all computer brands. Bell & Howell was Intel of the time.